Time: Map hand out at 6 pm. Course closure at 7.30 pm. 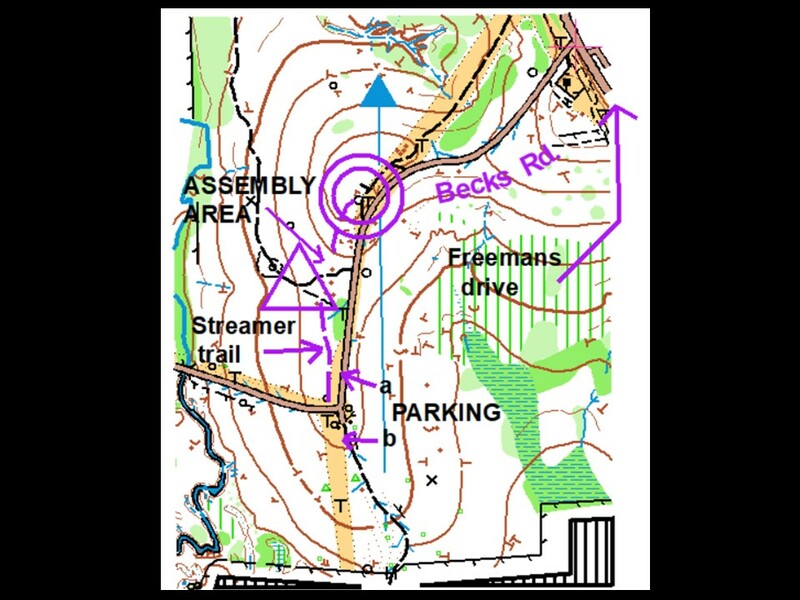 Courses: Hard (6 km) and Moderate (4 km) with shortening options. No results. No SI. Park sessions: Roughly monthly as indicated. Shorter courses, higher speed. Equipment: Orienteering gear. Head lamp. Compass. Cost: Gold coin donation to cover map printing costs. FROM THE NORTH. Head south on Freemans Drive for 3.75 km from the roundabout at Freemans Waterhole and turn right into Becks road. Then follow Becks road for 500m for parking along a power line. FROM THE SOUTH. 500m north of where the Cessnock Exit from the M1 motorway joins Freemans Drive, turn left into Becks road. Then as above. Parking: There will be two sections for parking. (a) Along the power line on the western side of the road. This may not suit low clearance vehicles. (b) Along the power line which heads south from the bend in the road. Suitable for all vehicles. VERY EASY: 1.5km. Follows tracks and streamer trails. EASY: 1.8km. Controls not far from tracks or streamer trails. MODERATE: 2.7km. Involves cross-country navigation to large features. HARD MEDIUM: 4.6km. Some difficult navigation. -- (b) A pivot control will (hopefully) mean that runners will not cross the main parking area. -- (c) These courses will have a separate finish. This will be marked with a control flag, not a “finish banner”. (2) The area north of Becks Rd. (used by all courses) is frequented by trail bikes and 4WD’s. If you hear them coming – move out of their way. (3) OLD STYLE SYMBOLS will be used. Mainly, tree-root mounds will be a brown “T”, oriented to match the direction of the fallen tree trunk. (4) Magnetic north lines are now 300m apart. (5) At least five helpers are needed to collect controls at each event.